Now that I’m nearing 30 I figured it was due time I learned how to pipe roses for cakes and cupcakes. I’ve always wanted to learn and I had some downtime from a minor surgery a few weeks ago so I watched a youtube video a tested a few. They were much easier than I had always expected but the downfall was that it was a hot summers day and even inside the house the buttercream was hard to keep at a nice 70 degrees so things weren’t turning out so great…so fast forward a few weeks later and I made these roses with a store bought decorator icing. Cheater I know, but I saw that it was shortening based which holds up better than a butter based icing, plus I don’t really want to eat them anyway (too much sugar all together) so it works for me. No my roses aren’t perfect by any means, I need to figure out how to get less cracking along the edges and things like that but they were fun to finally make even if they aren’t the best. 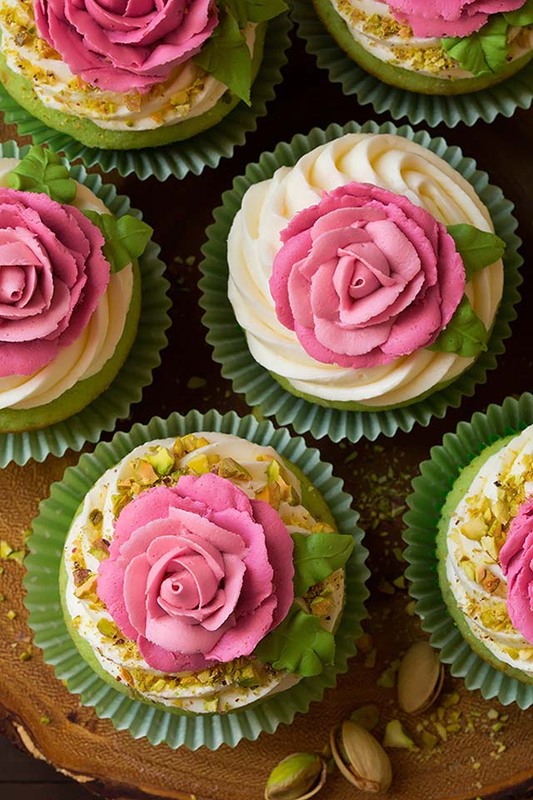 And what better way to decorate a dainty pistachio cupcake? 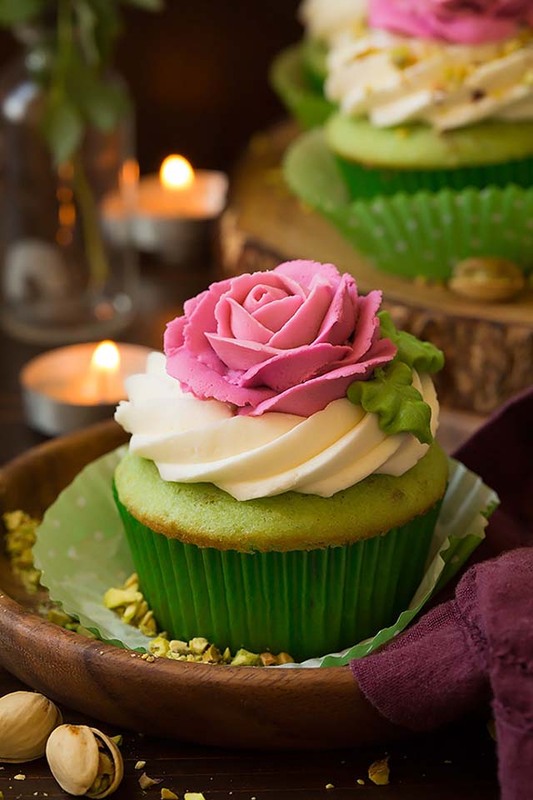 Another thing I’ve always wanted to make are pistachio cupcakes but I prefer natural flavors over imitation (unless it’s Cotton Candy, that’s always going to be imitation), and I finally came across a natural pistachio flavor. While it’s not very strong it get’s the job done if you use pretty generous amount of it. If you wanted to go the cheaper route you could use an imitation pistachio flavor but you’ll wan’t to use much less (see notes in the recipe) – but I can’t say the outcome will be quite as good. My husband labeled these as one of the best cupcakes he’s ever eaten and I’d have to say I’m a huge fan myself! They remind me so much of a good pistachio ice cream (one of my favorite flavors) and I love that they are perfectly soft and tender. Plus that buttercream is what dreams are made of! If like pistachios don’t pass these by! They’re such a decadently delicious cupcake! Preheat oven to 350 degrees. In a mixing bowl whisk together flour, cornstarch, baking powder and salt for 20 seconds, set aside. In the bowl of an electric stand mixer whip together butter and sugar until pale and fluffy. Mix in eggs one at a time then blend in pistachio flavor and green food coloring (I used about 8 liquid drops). Add 1/3 of the flour mixture and blend on low speed until combined then blend in 1/2 of the milk, then mix in 1/3 of the flour mixture followed by remaining 1/2 of the milk. Add last 1/3 of the flour mixture and mix just until nearly combined. Then remove bowl from stand mixer, add pistachios and fold mixture while scraping bowl to evenly incorporate pistachios and blend batter (don't over-mix). Divide batter among 12 paper lined muffin cups filling each 2/3 full (about 1/4 cup in each). Bake in preheated oven until toothpick inserted into center comes out clean, about 18 - 22 minutes. Remove from pan and cool on a wire rack 10 minutes then transfer to an airtight container to cool completely. In the bowl of an electric stand mixer whip butter until very pale and fluffy. Mix in heavy cream, pistachio flavor and powdered sugar. Whip until pale and fluffy. 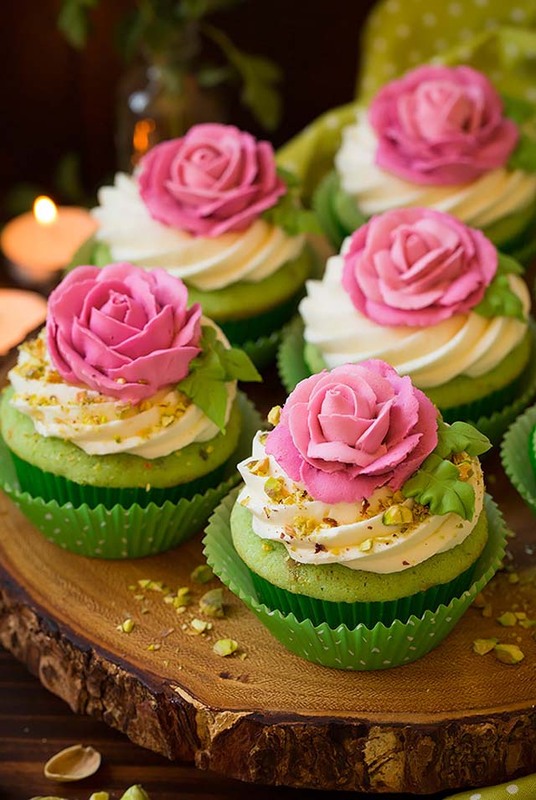 Pipe over cupcakes and sprinkle pistachios over top. Store in an airtight container. I used Beanilla's Natural Pistachio Flavor. 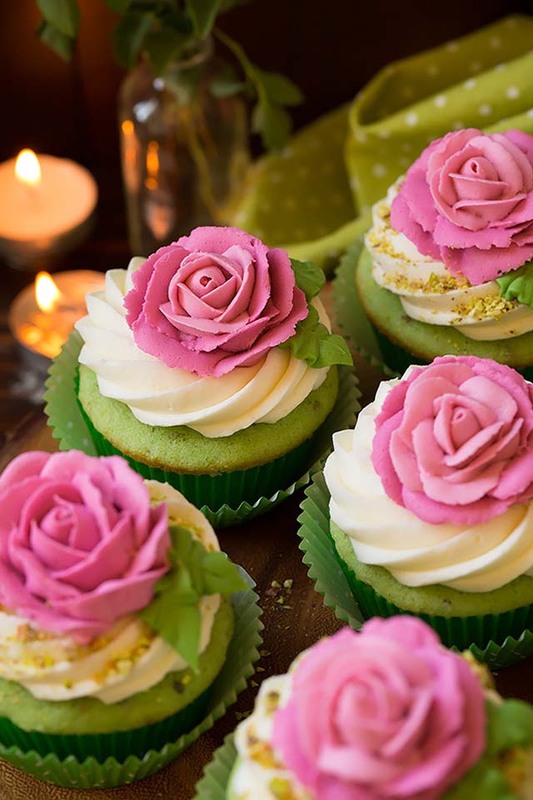 It tastes really close to almond extract if you are looking for a cheaper alternative, in the cupcake only use 3/4 tsp of the almond extract and 1/2 tsp in the frosting. If you are using an imitation pistachio flavor such as Lorann's you won't need near as much, probably 1/8 tsp in place of the 1 Tbsp.